[2:04] remove.bg – Remove the background from an image to make your own personalised photo story using your own photos and Creative Commons directory photosforclass.com which adds the attribution automatically to the images you download. Import your selfie and background into PowerPoint, Keynote or Google Slides and record the screen using Screencastify, Screencast-O-matic or iOS screen recording to add a voiceover for your presentation or dialogue. Check out Advanced Google Image Search or Flickr Creative Commons images too for more places to find royalty free images. Add remove.bg images to Book Creator for Chrome and use the Comic Book Style to make an eBook and add a voiceover. [8:05] @voseando – Sebastian Gluzman: Flipping the classroom using EDpuzzle and adding listening comprehension questions to short online Grammar explanation videos. [12:02] Creating your own grammar videos using ShowMe, iOS screenrecording and Pages to make your own screencasts to upload to Edpuzzle. Using Google Form Quizzes as an alternative to EdPuzzle. Overdubbing videos with Edpuzzle with your own voice. Using 30 second commercials and movie shorts or ‘cortometrajes’ to guide comprehension. [14:41] MFLtwitterati Takeaway: @mcmcnultyteach – the power of setting up language ambassadors at your school, languages of the month videos and greenscreening with Android and iOS app Kinemaster. Building community and promoting student voice. [21:44] @PRHSspanish – Meredith White: using Snapchat and Instagram in the world languages classroom to engage learners with authentic texts from the Spanish speaking world as well as sharing her own videos or photos written in Spanish or showcasing Spanish she finds in the real world. Using Snapchat as a broadcast medium promoting one way communication to share authentic resources in Spanish as a starter activity highlighting grammar points with captions and annotations. Creating physical books of your Instagram and Snapchat collections with Chatbooks.com and using them as language prize. See Storybird too. Using face filters and bitmojis when creating videos or photos in Spanish to ask questions and get students thinking. Doing a Twitter search for snapchat langchat to find lots of Meredith references. [30:55] @Langloudoun: using Instagram to upload a summary or write a summary explaining what they had understood in their languages lesson as a plenary task to help them think more deeply about their learning. Incorporating social media to make learning visible and as a way of engaging learners. 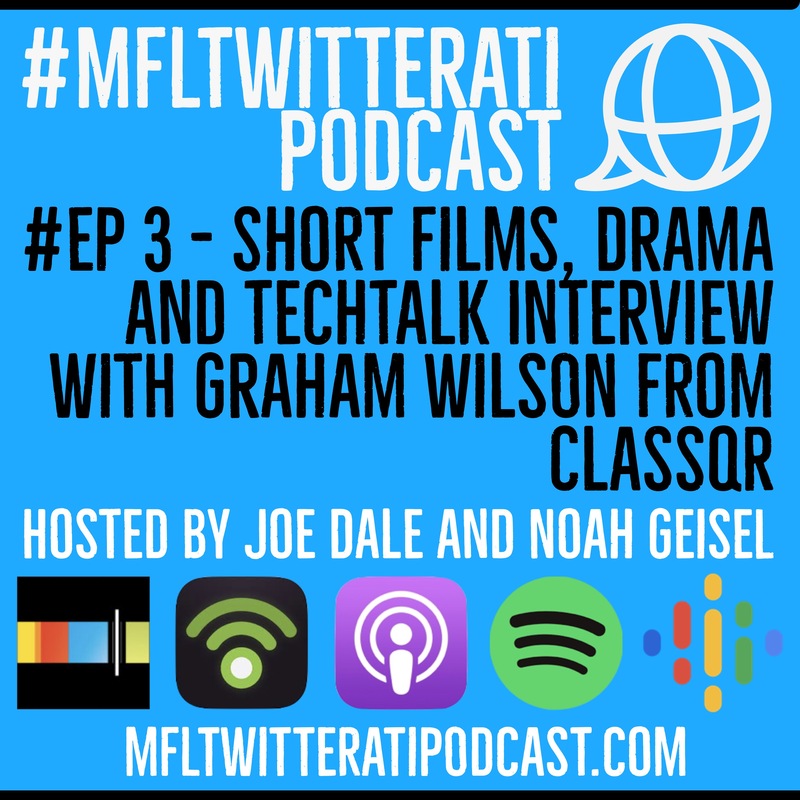 [37:04] MFL Show and Tell: focus on short films and drama. [38:22] @erzsiculshaw – using the iOS app Do Ink Green Screen to do green screening in the primary languages classroom to encourage young learners to practise speaking when doing weather forecasts, conversations in a range of contexts such as a café, a beach, a football stadium, a rain forest, a market etc. Creating comics including the children as the characters along with superimposed backgrounds to improve their writing skills. [40:13] @zorakhaled – Learning new skills and students’ leading their learning through multilingual digital storytelling, being inspired by a Goldsmiths University project and taking part in a British Film Institute event. [41:07] @HHSModlang – the value in taking part in the SEET ‘Our World’ Filmmaking weekend for language learners to promote speaking and to learn new skills. [42:45] @gorsey – Gorseville – One Stop Animation innovation – practising GCSE style transactional dialogues and publishing the results to a global audience on YouTube. The rigmarole of creating one stop animations ten years ago with Movie Maker. [44.36] Creative multilingualism and the Multilingual Performance Project and drama workshops for teachers with video support. [44.49] @creativelangs – Daniel Tyler-McTighe, the Director of the Multilingual Performance Project from Creative Multilingualism a four year research programme from Oxford University talking about the power of multilingualism and drama. [58:19] Mark Reid from the Education Department at the British Film Institute talking about screeninglanguages.org and their MFL Study Days. Mark would also love to hear from anyone interested in hosting a Study day in your local cinema. Email mark.reid@bfi.org.uk if you are. [1:00:28] @languagestwitte – Frederique Cheyns from Townley Grammar School describes some of the activities which take place during a BFI Study Day.